Syllabus of the Online Course (Subject): Costa Rica-China Free Trade Agreement (FTA). 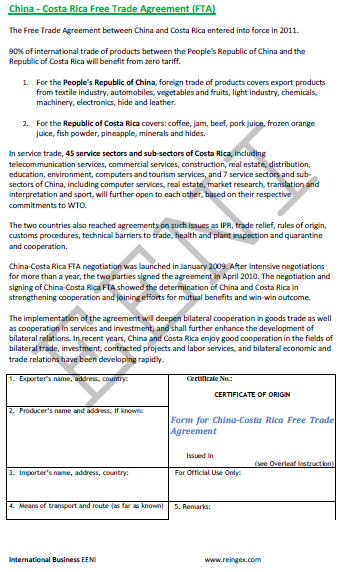 The Free Trade Agreement (FTA) between China and Costa Rica entered into force in 2011. 90% of international trade in goods between the People's Republic of China and the Republic of Costa Rica will benefit from zero tariffs. International Trade between China and Costa Rica. Costa Rica belongs to Latin American Economic Area (Western Civilisation) and China to Sinic Civilisation.